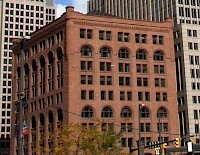 The Society for Savings Building, also known as the Society Corp. Building, is a high-rise building on Public Square in downtown Cleveland, Ohio, United States. The building was constructed in 1889, and stood as the tallest building in Cleveland until 1896, when it was surpassed by the 221-foot (67 m) Guardian Bank Building. The building stands 152 feet (46 m) tall, with 10 floors.